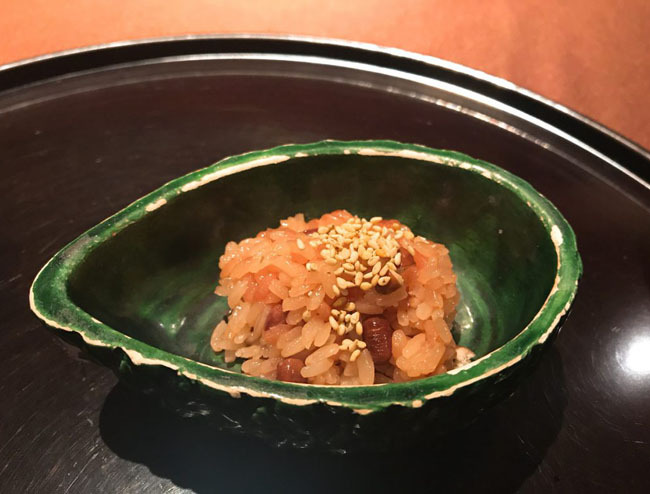 Owner of Yuki Shouji Yuki is the grandson of the founder of “Yuki Teiichi” the creator of world-famous “Kitcho”. 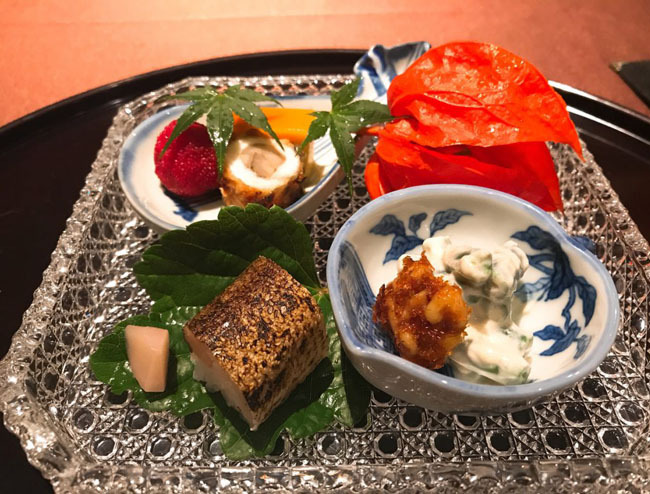 Some of you may be familiar with Kitcho, as it is one of the most well-known restaurants in Japan for its exceptional Japanese cuisine. Yuki has three different locations in Osaka. We visited the “Shinten” location. 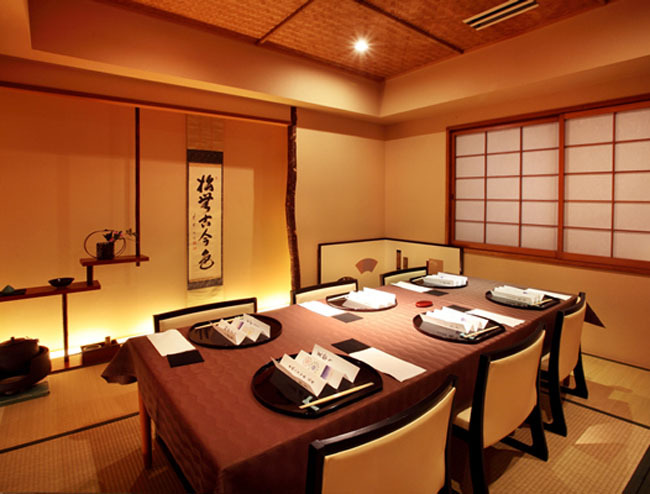 The Shinten location of Shinten has more of a traditional type of decor, with tatami flooring, a Japanese alcove called “tokonoma” and so on. 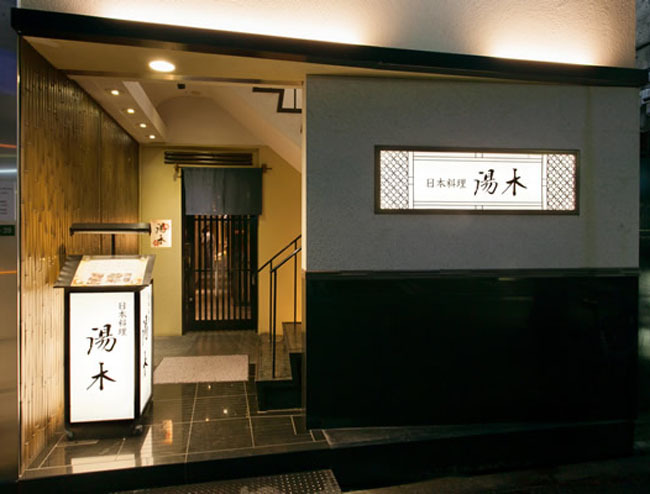 Judging by the pictures on the website, the Honten location has more of a modern type of atmosphere. 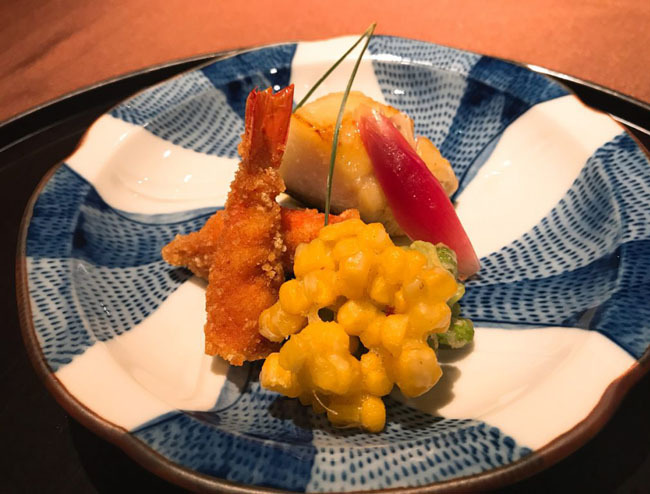 One of the defining features of Yuki is how they are able to cook the food just right to bring out the deep natural flavors of the season ingredients. 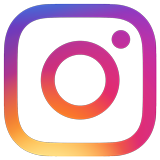 The food is very flavorful and is well balanced. The brilliantly colored “Hassun” to start the meal. 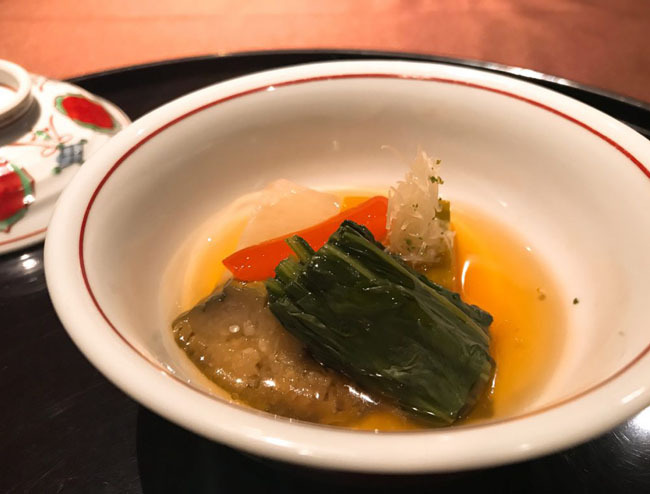 It is one of the dishes where the season is particularly expressed not only by the ingredients used, but by the plating itself. The soup was very elegant. 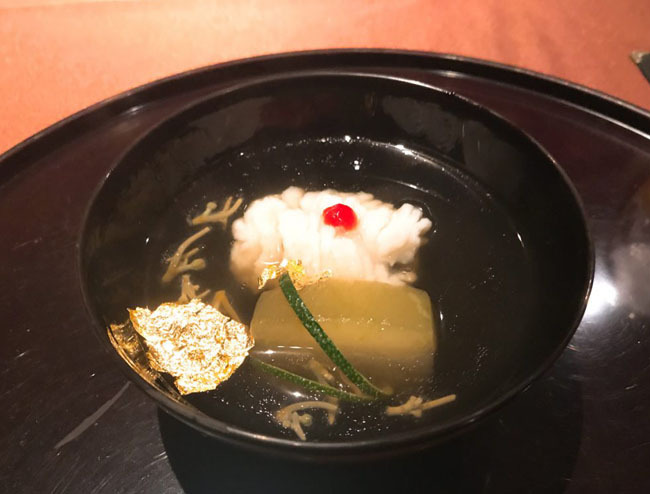 As you can see, there was gold leaf in the soup. I believe this sashimi dish is designed to stimulate your appetite. It definitely whet my appetite! The sashimi was very fresh and went well with the freshly grated wasabi. 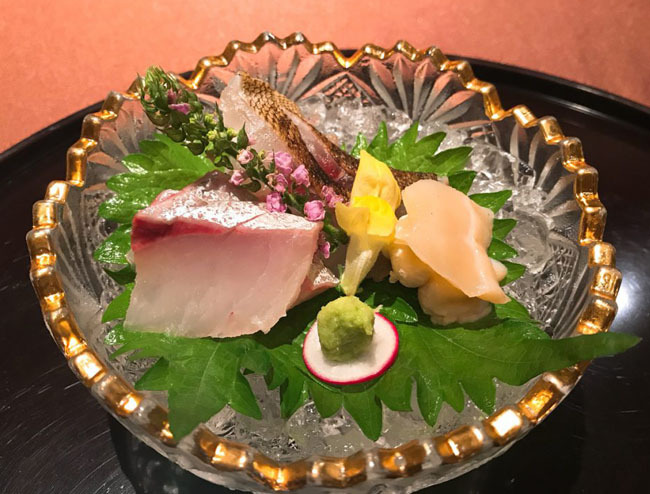 Actually, the majority of people visiting Japan have never had “real” wasabi unless they have dined at a fine restaurant in Japan. Believe it or not but the wasabi in other countries is fake, it is artificially produced because it is too difficult to make real wasabi (even probably 95% in Japan is artificially produced. To find real wasabi, you’d have to visit a nice restaurant. Real wasabi has a much more complex taste, though much more delicate in flavor. 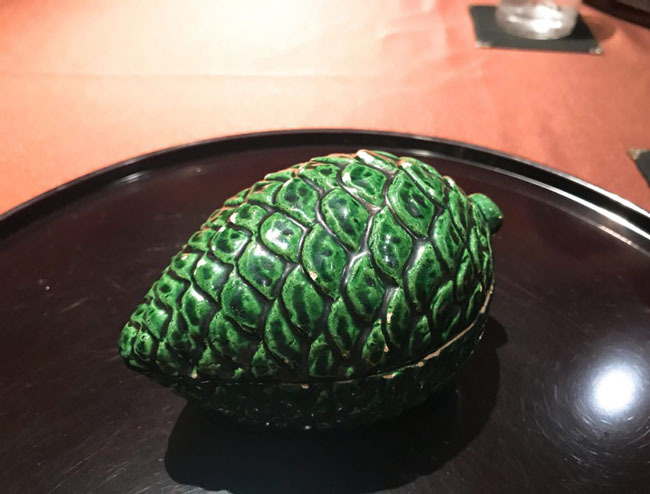 This dish was interesting, it came in a dish in the shape of a pine cone. I was pleasantly surprised by this dish, it is “sekihan” or steamed sticky rice mixed with azuki beans. It is traditionally a dish served in celebratory times such as birthdays, weddings or holidays. It has a red color because the color of red is symbolic of happiness in Japan. The rice of ancient times was red, and the color red is particularly important in Japanese culture. Red (together with white) is used in weddings for decorations, as gift wrapping, and even seen at shrines where “miko” or shrine maidens are wearing red and white (the Japanese flag is also red and white too). This fried dish had fried shrimp which wasn’t greasy or oily at all, it was very crispy! The soup pictured above had a mellow taste which complemented the vegetables quite nicely. 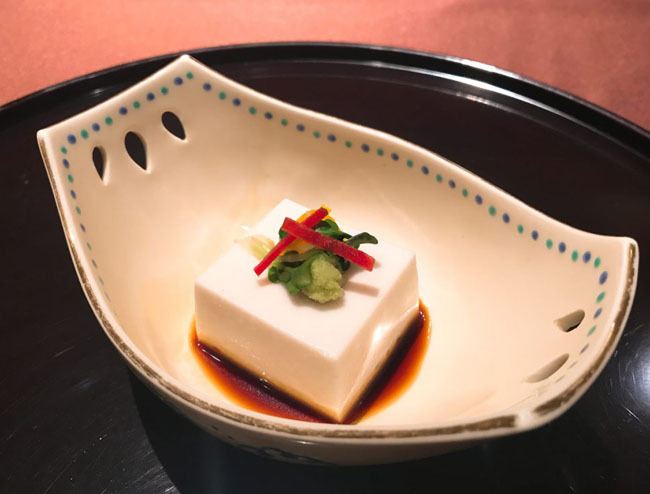 The tofu was not only refreshing but also to bring the taste buds back to a more neutral state and prepare the palate for the next dish. This main dish is Wagyu. 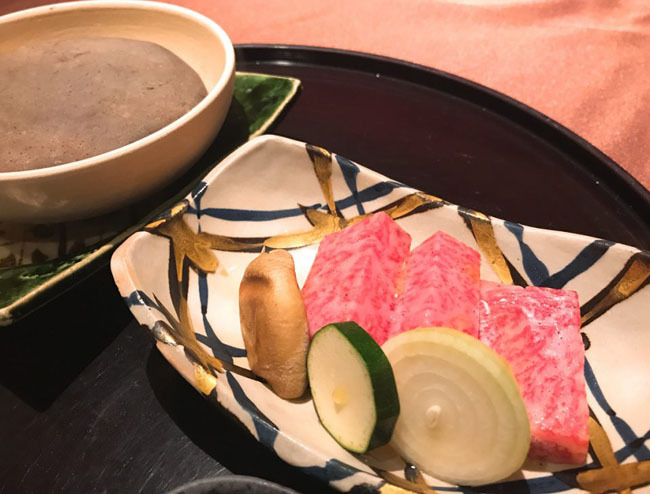 The stone you see next to it, is so you can put the wagyu on the stone and cook it however you like your meat done. It cooks relatively fast. I actually do not think I have seen this done anywhere else. It was quite nice cooking it myself as I am very particular about the way my meat is cooked. This was the last dish to finish the meal. 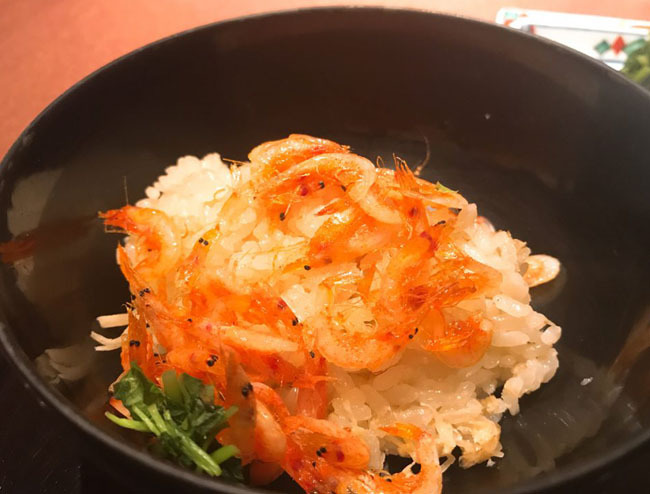 Those are tiny shrimps you see in the rice. Acutally, there was a dessert after this dish. It was a fruit, and was really refreshing and delicious. In fact, it looked so delicious and I ate it so quickly that I only realized that I had forgotten to take a picture after I had already eaten it! Sorry about that! At Yuki the courses were a fantastic balance of tastes and volume of fish, meat, and vegetables. The course is great for those that like to enjoy wine or Japanese sake with their meal (I actually got some recommendations from the staff that went perfectly with my meal). The staff were very friendly and helpful. Though they didn’t speak perfect English, I was able to generally communicate what I wanted to say, and understand what they wanted to get across. I would definitely visit this restaurant again! Lunch at Ichijunisai Ueno Toyonaka! Why are prices going up at restaurants that serve authentic Kobe Beef? Japanese Omi beef in Tokyo!